← T-Mobile To Partner With OnStar? I’m on the way down to the mall now so I can be first in line. NOT BEFORE ME MY FRIEND!!!. Oh wait the home gardening channel is on….nevermind. Sorry that every post can’t be deemed newsworthy by your standards! On a more positive note, have you seen HTC posted G2 info on their site? I guess in advance of the event tomorrow. I wish they would give more info. I am curious to know what is so special about their “z” (or whatever they call it) hinge. I doubt the event is related to the G2. 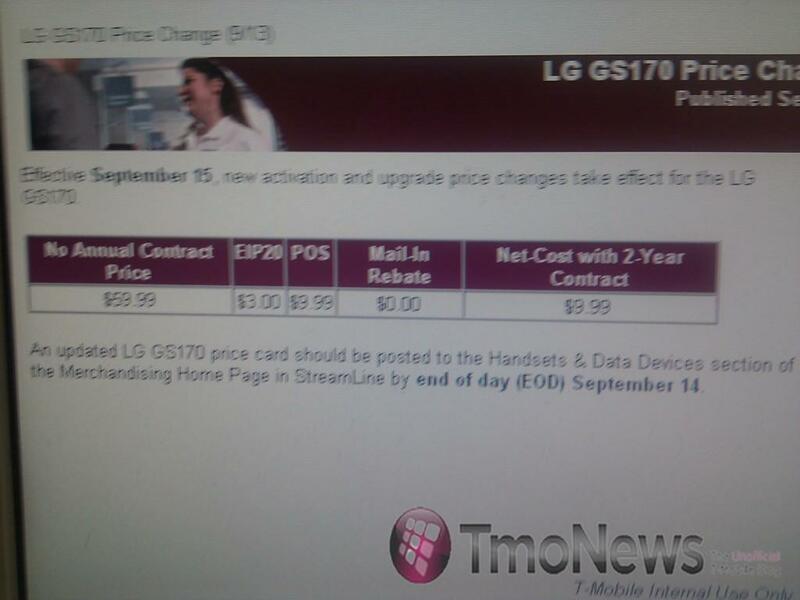 Also we’ve already had those specs posted: https://www.tmonews.com/2010/09/t-mobile-g2-gets-compared-to-the-rest-of-the-competition/ Nothing new there. Just because its something that doesn’t interest you doesn’t mean it doesn’t belong on the site. This website is dedicated to bringing anything new that happens with T-Mobile. It doesn’t always have to be about Smartphones, Android or 3G. You obviously didn’t read my comment below. The intent of my comment was wrapped in sarcasm. If you really must know – I was surprised to see this article – not because it wasn’t 3g, Android or a Smartphone, but because it really doesn’t fit the demographic of the average visitor that I imagine visits this site. I prefaced my comment with “Not trying to be negative here” and I meant that – or I would not have said it. I guess if you find low-end flip phone pricing interesting, more power to you – I am not judging you or anyone else that might find it a ‘good read’. I honestly thought the article was written tongue-in-cheek. Oh another slow news day comment, how I love these! LOL. Don’t worry about it David. Most of us appreciate anything and everything that is posted on here as we follow our beloved Magenta. All news on here is good news in my book. $10 is $10 – it helps to defray that activation fee. Additionally, it’s important that we don’t ignore all segments of the market when we report the news – otherwise, we’re FOX. Sorry – couldn’t resist. Peculiar, why would they raise the price on a flip phone? This phone has been out of stock the moment it comes in. For people wanting a free flip phone, its one of the first ones they grab.. probably because its red. They are “probably” raising the price to stem the demand slightly and of course take advantage of its popularity. Most of us are jaded on here when it comes to crap…errr.. basic phones, but there is still a large segment that refuses to get out of the stone age of cell phones and this type of phone is what they want. I bet they won’t be producing “basic” flip phones in just a few years max. With the superfast speeds becoming the norm, a phone like the Cliq will be considered Basic and Web2go will finally be free. No!!! My parent’s can’t use anything else beside a flip phone! htc has the h2 on their site now. on the right it says “pre register at tmobile”..damn i was hoping for pre register. The days are closing for this awesome phone to come out. I have a feeling pre registering will start next week instead of today as i have expected. I’d love to know why there is a Euro G2/US G2, and a Euro HD/EVO and then there’s the baby myTouch HD?!?! Whats the motive there? same here Pimpstrong. If the MyTouch HD had a 4.3 inch screen, I would be buying it. Now unfortunately, all I have to look forward to is the HD7 and I don’t like how WP7 is looking but there are no other 4.3 inch monsters on Tmo. And I’ll be using my FFC ALOT. Do you guys think we’ll be getting a form of the desire hd, either as the mytouch hd or some other name? I’m starting to have doubts. Interested in your opinions. I’m sure no one thought of a US announcement and the MTHD is deff a whole diff bread of phone but the idea behind the “HD” phones is the same. Unfortunently TMO’s idea of an HD phone is vastly diluted especially when compared to the HD2!! SMH. WOW! There is more video at the same link. The Desire Z has an instant-on bootloader! I hope the G2 has that. I hope that isn’t for Sense only. How the hell does that work? Everyone wil copy this tech! XDA should port this to all phones unless its hardware related. That start up is AMAZING on the G2. I’ve never seen a phone start up that quick, not even a dumbphone. WOW. G2 is an amazing phone. OK, I may have missed some bits & pieces of info here but has it been **CONFIRMED** that the USA version of the HTC Desire HD is going to be the MyTouch HD just in a different body or is that uncomfirmed? Or are they both totally different phones? It would be cool if T-Mobile USA would release the HTC Desire HD as the T-Mobile G2 HD. I would totally jump on that if that were the case. My contract is up in mid-November and I would definitely get that phone. The stuff announced today is for Europe for right now, the G2 is the American version of what was announced today, hence why its not getting the new “sense” platform. This stuff from what we can tell today, had nothing to do with the US, all the more reason why it wasn’t announced in the US. Nothing is confirmed about the Mytouch HD. This is a time for speculation and rumors. You know, the fun time! If Tmo does bring over a version of the desire hd, which is an evo with a newer SoC, it will sell so fast they won’t be able to keep it in stock! This phone is actually much better than the T139. T-Mobile needs to seriously consider replacing that horrible Samsung with this model. MUCH MUCH MUCH better reception..
Just wanted to chime in here and say thanks for keeping on the site. I always start my day checking tmonews. As for the phone, for the slack that it receives it still serves its purpose. T-Mobile doesn’t revolve around smartphones and $30 data plans. oh yea david your going down….. you think your koool huh? hey Kickstar13 was it really that slow today? a flip phone? i mean htc held a event today….. you guys are gettin real lazy!!!! Enjoy having your IP blacklisted…the banhammer drops!